Christopher Columbus and his crew were the first Europeans to have contact with cocoa beans. 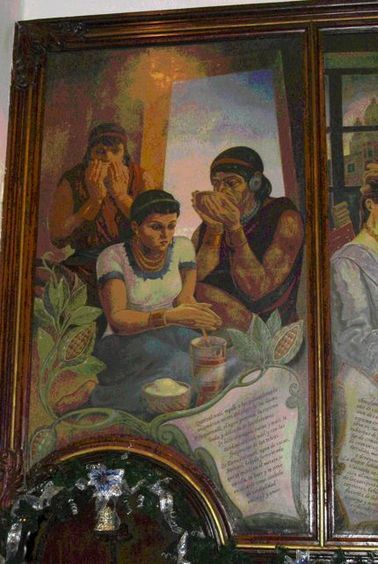 "Many of the almonds [cacao beans] which the Indians of New Spain use as currency; and these the Indians in the canoe valued greatly, for I noticed that when they were brought aboard with the other goods, and some fell to the floor, all the Indians stooped to pick them up as if they had lost something of great value." Columbus and his crew soon learned that those mysterious-looking "almonds" in the bottom of the boat were used by the indigenous people of the Americas as coinage. For example, in 1513, Hernando de Oviedo y Valdez paid one hundred cocoa beans to purchase a slave. So valued were cocoa beans that counterfeiters were known to fill empty cocoa shells with clay or earth. In the New World, cacao was money and it grew on trees. Not surprisingly, when Columbus introduced the drab cocoa bean to the Spanish court, the royals focused instead on the valuable gold, silver, and other New World treasures. Only in 1544, when Dominicans tantalized the court with prepared chocolate presented by a Kekchi Maya delegation of New World natives, did it slowly gain popularity. From 1585 to 1630 Spain attempted to maintain a monopoly on cacao. Chocolate lover and priest Peter Martyr d'Anghera's (1457-1526) official chronicle of the New World, characterized chocolate among the luxuries at the court of Montezuma and described it "as wine, a wonderful drink, fitte for a king." Later the Spanish enjoyed the privilege of the exotic chocolate import when Seville welcomed its first significant chocolate cargo in 1591, though there had been smaller, private imports prior to that. These shipments of cacao ultimately achieved such renown that they voyaged with what was called the "chocolate wind," or viento chocolatero, the name given in Mexico for the favorable northern breezes. We are beholden to Columbus' contact with the New World's chocolate resources for our chocolate addictions, including this New World Hot Chocolate. Deborah R. Prinz lectures about chocolate and Jews around the world. Her book, "On the Chocolate Trail: A Delicious Adventure Connecting Jews, Religions, History, Travel, Rituals and Recipes to the Magic of Cacao", was published in 2013 by Jewish Lights and is in its second printing. The book is used in adult study, classroom settings, book clubs and chocolate tastings. Prinz writes for On the Chocolate Trail, Jew and the Carrot and elsewhere. Free download: Materials and discussion guides for book groups.